Derek South is a veteran business executive having spent his entire 35 year career in the trenches building high tech companies. Most recently he is involved with an early stage startup applying artificial intelligence to solve the complex challenges of today’s telecommunications infrastructure. His years of experience include: building teams, launching products, raising capital, and interfacing with large global customers provides Families’ Bridge with a vast knowledge base. This multi-discipline experience has helped launch Families’ Bridge, and turn a dream into reality. 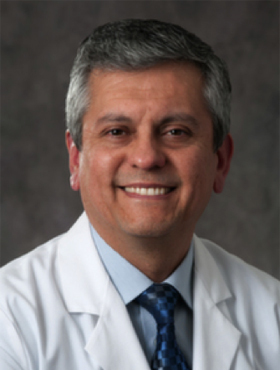 Dr. Perez, board certified in pediatrics and neonatal-perinatal medicine, received his medical degree from the Universidad Peruana Cayetano Heredia in Lima, Peru. He completed his residency in pediatrics at the State University of New York at Brooklyn, Children’s Medical Center and his neonatal-perinatal fellowship training at Baylor College of Medicine in Houston. In 2002 and 2005, he received the American Medical Association Physician Recognition Award in Continuing Medical Education. Dr. Suzanne Staebler is an expert clinician, advocate, and nationally recognized leader in the field of neonatal advanced practiced nursing. She has been practicing as a Neonatal Nurse Practitioner (NNP) since 1992 and has been involved in policy and advocacy since 2007. Dr. Staebler is currently an Associate Professor and Specialty Coordinator for the Neonatal NP program at Emory University Nell Hodgson Woodruff School of Nursing. She maintains her clinical practice as an NNP in Atlanta and continues her work in health policy as a policy advisor with the Alliance for Patient Access (AfPA) and the National Coalition for Infant Health (NCfIH).She was the APRN Director for the Georgia Nurses Association from Oct 2014-2017. Suzanne continues her represent the neonatal population on the APRN Consensus Group (LACE) Task Force. She currently serves as President of the Board of Directors for the National Certification Corporation (NCC), the national certification board for neonatal and women’s health nurse practitioners. Dr. Staebler has demonstrated leadership in the policy/advocacy arena. She was the lead author on a white paper discussing the future of neonatal advanced practice nursing, which has served to inform all stakeholders on issues related the high-risk maternal/infant care. Her leadership roles within the National Association of NNPs (NANNP) were pivotal to ongoing discussions centered on developing a medical home model for premature infants. Informed by her doctoral work on designing regionalized care systems for high-risk mothers and neonates and the policy implications of regionalized care delivery models, Dr. Staebler drew on her wealth of practical experience to educate and support the expanded role of the NNP in health care delivery of this vulnerable patient population. Her impact in the policy and advocacy arena and her dedication to educating nurses about advocacy and policy has been far reaching. She has received several awards for this work including the Distinguished Service Award from the National Association of Neonatal Nurses (2010), the Georgia Nurse Practitioner Advocate of the Year award from the American Association of Nurse Practitioners (2015), the NNP Excellence Award from NANNP (2015), the Academic Nurse Of the Year award from the Georgia March of Dimes (2016) and the Outstanding Policy Leader Award from the National Organization of Nurse Practitioner Faculties in 2018. Dr. Staebler’s passion for policy and advocacy, with a focus on utilizing evidence to drive policy decisions and monitoring policy outcomes has led to her being awarded several prestigious policy fellowships including Faculty Policy Intensive Fellow from the American Association of Colleges of Nursing (AACN) and the inaugural Georgia Nursing Health Policy Fellowship with the Georgia Health Policy Center at Georgia State University. Kelli D. Kelley is the founder and Executive Director of Hand to Hold, a national nonprofit organization dedicated to providing education and support for NICU families. As the mother of two children born preterm – Jackson Thomas born at 24 weeks in 2000 and Lauren Elizabeth born at 34 weeks in 2003, she has invested her time and talents during the past 10 years to raise awareness of the growing problem of preterm birth, and to support families who share her experience. Kelli received a bachelor of journalism degree from The University of Texas at Austin. In her free time, she enjoys spending time with her husband, children and friends, reading, cooking, exercising and volunteering with her daughter. Katie joined the Board in 2018. She has a Bachelors Degree in Speech Pathology from The University of Oklahoma, and a Masters Degree in Applied Behavioral Analysis with an Emphasis in Autism from Ball State. As a mother of a four-year-old, Katie brings the perspective of a new parent to the Families’ Bridge Board, in addition to her academic credentials.